Seller: Open Text Corp; FirstClass Div. 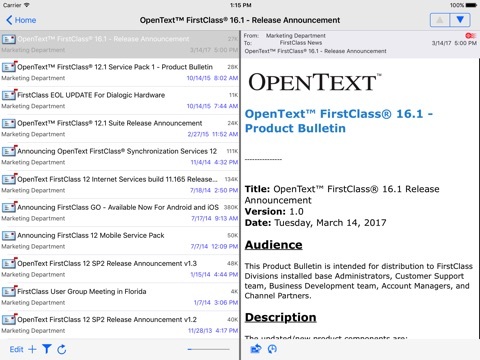 More by Open Text Corp. Your FirstClass content is now just a touch and a slide away! With FirstClass Mobile, iPhone®, iPod touch®, and iPad™ users can now take FirstClass with them on the road and have all of the power of FirstClass in the palm of their hands — delivering a true “anytime, anywhere” mobile collaboration experience. •   Create, view, reply to, forward and delete email in their FirstClass account. •   Play voice messages encoded in MP3 format. •   View and access all containers on their FirstClass desktop. •   Read, forward, reply to, and check history of messages in FirstClass Conferences. •   Access a list of bookmarks created in the desktop version of FirstClass. •   View documents created in the FirstClass desktop client. •   View files uploaded to FirstClass, including images, text files and PDFs. •   Search for FirstClass content from the FirstClass Mobile home screen. •   Access FirstClass calendars and contacts.